How good was 2015’s slate of horror movies? It was so deep that it's currently February, and I’m still running into likely all-timers like Hellions and Bone Tomahawk. I honestly believe future retrospectives will center on last year’s incredible array of genre offerings. However, I won’t be at least a little surprised when folks look back and wonder how we all slept on a Guillermo del Toro horror movie. And not just any horror movie either—Crimson Peak is a big, lavish throwback to the candy-colored, phantasmagoric fever dreams of Hammer Films and American International Pictures. Its very existence feels monumental, and, if we’re being honest, a bit staggering in this era where studios are less willing to take risks on original films, especially ones with a nebulous target audience. Even though its cast all but assured it would at least double as a Tumblr gif factory, it’s hard to immediately recognize just for whom Crimson Peak was made. As it (unsurprisingly) turns out, I am certainly in the target audience of a film that’s unafraid to go big and bold, especially in regards to a Gothic sensibility that’s so potent you’d swear del Toro uncovered some lost 19th century manuscript. Crimson Peak is perhaps the type of story that may have been dreamt to life had Byron and the Shelleys staged another storytelling contest during their orgiastic retreats. Forbidden romance, family secrets, and bodies stowed away in a decrepit, foreboding mansion on a hill intersect as aspiring American writer Edith Cushing (Mia Wasikowska) falls in love with mysterious British aristocrat Thomas Sharp (Tom Hiddleston). Despite the protests of the former’s father and the reservations of latter’s sister (Jessica Chastain), the two wed, and Edith is swiftly swept away to Allerdale Hall, Sharpe’s secluded family estate resting atop a mountain of ice and clay. Spirits swirl about the cavernous, decaying estate, echoes of both the film’s own backstory and the genre it inhabits. Like Edith (herself a gothic author drawn to such sensibilities), audiences find themselves swooning and recoiling in equal measure amidst a Technicolor nightmare. Sumptuous don’t just lurk around every corner—they’re embedded into the corners, including those that are crumbling into the clay slowly claiming Allerdale Hall’s foundation as its own. Even at its most macabre, Crimson Peak retains the forbidden allure that has defined the horror genre, particularly its gothic roots: just as 19th-century writers wed the gorgeous and the ghoulish with ornate prose, so too does del Toro craft an immaculate, baroque tableau of gilded halls, gnarled specters, and wounded souls. Allerdale Hall is a Gothic novel, full of lurid, page-turning intrigue fueled by innuendo, soft whispers, and cryptic conversations. It’s tempting to regard Crimson Peak as the type of film where the mise-en-scene and ambiance become characters in their own right, perhaps at the expense of the story and actual characters. While it’s true that Allerdale Hall does creak to life, it does not swallow its inhabitants whole—at least from a storytelling perspective. Crimson Peak feels like it could be an overwhelming mood piece (and an absolutely riveting one at that), but del Toro resists the urge to simply indulge in an aesthetics exercise. As his trio of damned souls begins to collide into each other, he scours the wreckage and pulls their mangled flesh from the fray. Their twisted souls, however, are not so easily rescued: in the film’s climactic moments, he taps into that Gothic propensity for tempestuous emotions, captured here in del Toro’s distinct, hushed tones. It’s these anguished, lovelorn murmurs that linger beyond the violence, luring viewers into a swoon that plunges to sublime, haunting depths. No one extracts fragile, melancholy moments from a horrific, ghastly rubble quite like del Doro, and Crimson Peak is his most exquisite, delicate English-language effort yet. Credit is due to Universal for both championing Crimson Peak and not treating it as an afterthought, even if it won’t go down as a huge success on the studio’s books. Rather than deliver a half-hearted home video release, they’ve gone all-out with a DVD/Blu-ray combo pack that’s full of supplements. Chief among them is a feature-length commentary with del Toro, a track that packs an absurd amount of information (ranging from anecdotes to masterclass mini-lessons) in two hours. Regardless of how one feels about del Toro’s work, it’s hard to deny just how absorbing and infectious he is when discussing film (his own work and otherwise). Over an hour’s worth further material is spread across various features. 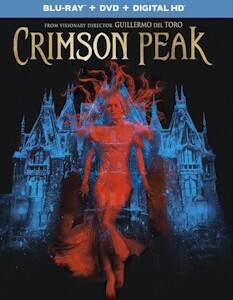 “I Remember Crimson Peak” is a four-part guided tour through some of the film’s locations, such as “The Gothic Corridor” and “The Red Clay Mines.” Del Toro and the cast provide “A Primer on Gothic Romance,” a self-explanatory bit that couches Crimson Peak in its genre’s context. The director and his crew’s attention to detail is highlighted throughout “The Light and Dark of Crimson Peak,” “Hand-Tailored Gothic,” and “A Living Thing,” three features dedicated to the cinematography, costuming, and Allerdale Hall set, respectively. Each feature hones in on the minutiae of each craft, revealing small but crucial details that confirm why del Toro is one of our great filmmakers. In one of the more surprising features, “Crimson Phantoms” discusses the ghost effects, which were achieved with both practical and digital work, something that may be note for those who (like me) assumed it was only realized with the latter. Finally, Hiddleston provides a tour of Allerdale Hall in “Beware of Crimson Peak,” which provides yet another excuse for viewers to luxuriate in this miraculous set design. In the annuls of old, dark houses, del Toro’s is among the most dazzling, its striking façade serving as a metaphor for the film’s musings on deception and repression. Beneath the exterior, something rotten festers, threatening to bubble to the surface and consume the inhabitants. Just as no one leaves Allerdale Hall unscathed, viewers may find it difficult to shake the delirious, intoxicating Crimson Peak. This isn't just of last year’s greatest horror films—it’s one of the best 2015 had to offer, period.